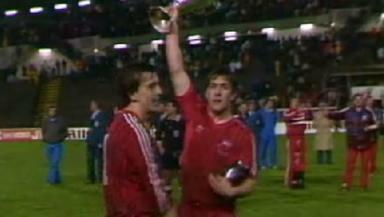 Aberdeen cruised past Waterschei in the semi-finals of the European Cup-Winners Cup. Dianne Burgess was just 20 when she walked to Pittodrie for Aberdeen's European Cup-Winners Cup semi-final tie with Waterschei, 30 years ago. Yet such was the momentum and derring-do which had been generated by the Dons during their previous wins over Sion, Dinamo Tirana, Lech Poznan and Bayern Munich that Burgess was in no way ruffled by encountering a number of Belgian supporters en route to the match. "Their fans were enjoying themselves on the way to the stadium, and one of them laughed while saying to me, 'We will beat you 2-1'," she remembers. 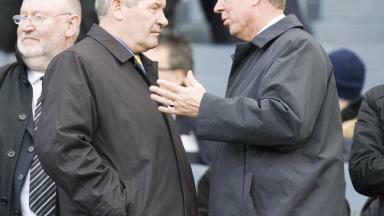 "So I remarked straight back, 'No, we will beat you 4-0'. But then he responded, 'No, no, you don't know Waterschei'. "So I just replied, 'Well, you don't know Aberdeen' and we had a good laugh. But I was right!" Such was the irrepressible sense among Dons aficionados that anything appeared possible once they had swept past Bayern in dramatic circumstances. Yet typically, even in the aftermath of one of the club's biggest triumphs, Alex Ferguson and his trusty lieutenant Archie Knox took absolutely nothing for granted against the little-known side who had eliminated mighty PSG at the quarter-final stages. As Ferguson recollected: "There was no way that we were going to underestimate anyone. Once again, we did our homework and Archie and I went to see Waterschei play away to Bruges one cold Sunday in spring. "We were definitely impressed, particularly with their two [international] strikers, and Archie also watched them at home. "But my main worry was that, having reached the semis, the players might think that they could just turn up and go on to win the trophy. "With this in mind, we proceeded to lose two Premier League games, missing out to both Dundee United and St Mirren at home. The latter was our worst performance of the season and effectively cost us the championship title. It wasn't acceptable and my main concern was to get our form back." If their fans were feeling any nerves, they kept them well hidden. 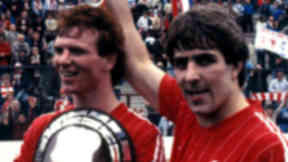 Ronnie Mowat still visits Pittodrie "once or twice a year", but, back in 1983, he was in thrall to the likes of Willie Miller and Alex McLeish, Doug Bell and Mark McGhee, Gordon Strachan and John Hewitt. And even prior to a ball being kicked he was convinced that Ferguson's ensemble would possess too many threats for their rivals to handle. Mowat recalled: "We never doubted their quality at that time and, after getting past Bayern, there was a rising tide of anticipation. The buzz around the stadium before kick-off was really positive and there was a widespread feeling of "Bring them on!" "I didn't have any nerves, not with the calibre of players we had. But then again I had never even heard of Waterschei before they travelled to Aberdeen. And, once the match started, they did nothing to dent our optimism." If anything, the contest was effectively over before it properly caught fire as the Dons throng were granted an early chance to commence making travel plans for the final in Gothenburg on May 11. Bell was their chief magician, bewitching and bothering the Belgians and, as Ferguson related: "We couldn't have got a better start with Doug running amok to set up Eric Black and then [Neil] Simpson's determination giving him the second goal after beating three men. And all that happened inside five minutes. "Two goals from McGhee in the second-half, as well as a header from [Peter] Weir gave us a 5-1 lead to take to Belgium for the second leg. It was the perfect game for Bell, which made it all the more disappointing he got injured [against Celtic] and missed the rest of the season." Aberdeen's success was as emphatic as it sounds, and there was never any prospect of their adversaries retrieving the situation in the second leg, although they gained a modicum of consolation with a low-key 1-0 win. But for the majority of people, that outcome was overshadowed by the sickening injury suffered by the redoubtable Stuart Kennedy, who crashed into the hoarding at the edge of the ground. It was a freak occurrence which subsequently brought the curtain down on his illustrious career, though he and Bell were both named in Ferguson's squad for the final: a tribute to the pair''s heroics in previous rounds. Yet the extent to which the incident affected the Dons luminaries was summed up by the normally phlegmatic Willie Miller. He later declared, in his autobiography: "It was a personal tragedy shared by everybody at Aberdeen FC, for he was one of our finest footballers. "Stuart was a great bloke, a true professional, and I never had to worry about him. He was quick, extremely competent and a big loss on the park and in the dressing room. In fact, I reckon he was the club's greatest-ever full-back." None of the supporters who witnessed the Waterschei clashes could have guessed the scale of Kennedy's travails. In any case, they had other more pleasant matters to tax their minds: the lip-smacking thought that Aberdeen stood on the threshold of European glory.